I’ll be honest and tell you that my family eats meat with dinner every night, except for when we have lasagna or the garden vegetable soup or bean and cheese burritos from my freezer cookbooks. That doesn’t mean I don’t know a good vegetarian crockpot recipe when I see one, though. 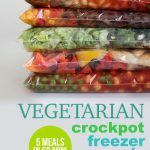 I’ve made hundreds of make-ahead crockpot recipes, and I can tell you that these vegetarian recipes will freeze perfectly. And, the best part is that you don’t have to do any cooking ahead of time – simply combine the ingredients and freeze! When you’re ready to eat, thaw the bag in your refrigerator overnight or in a bowl of cold water. Cook according to the recipes instructions and add 1-2 hours if the meal isn’t totally thawed. Enjoy! Thoughts or questions? Leave a comment below and I’ll get back to you as soon as I can! 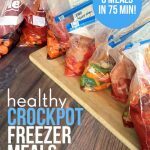 I’m new to your website and love it, I plan to buy a crock pot to start preparing meals. Can you suggest which one is a good one? I appreciate your input. Here is the one that I recommend: Crock-Pot 6 Quart Programmable Cook and Carry. I think 6 quart is the perfect size if you only have one slow cooker, and having a timer is awesome because you don’t to have to be home to switch it to warm or turn it off. The clips are just a bonus if you make something for a holiday or potluck and need to take your crockpot in the car with you and don’t want it to spill. This tasted so nasty that my husband who eats everything took one bite and stopped. Sorry. Thank you so much! 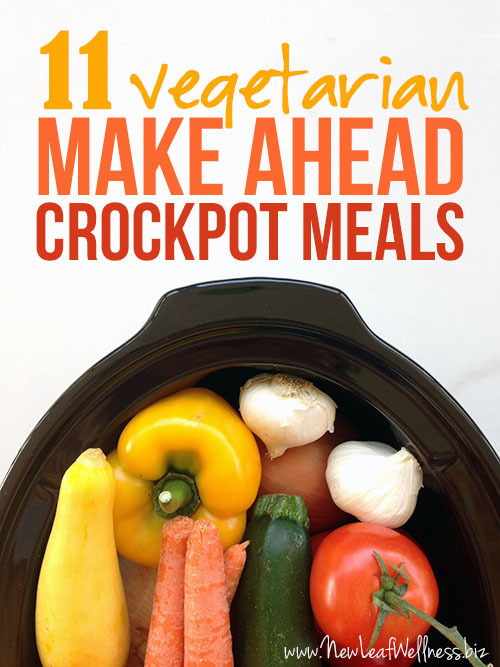 We are vegetarians and it can be difficult to find crockpot meals! Can’t wait to try these! I discovered your website through Pinterest yesterday. I was hunting for a couple of crock pot recipes to throwl in the freezer. I love that you do a shopping list. It made it’s so easy just to print out the list and head out the door to the grocery store. Do your cookbooks include shopping list or meal groups as well? Thanks, Alicia! 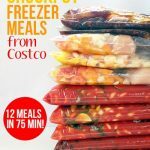 The 15-Minute Freezer Recipes book includes a grocery list for all 10 recipes. 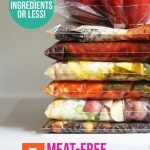 The No Cook Freezer Meals book includes a grocery list for 18 recipes. I have both cookbooks and they are great! I have the vegetable barley soup in my slow cooker right now and it smells great! However I’m noticing that it looks pretty thick. Is this how it should be? Or should I add more broth? Thanks, Lorie! We eat it pretty thick, but you are welcome to add more broth if you prefer a thinner soup.